Historic site of Jepo Waegwan discovered. March. 13, 2019 07:40. by Won-Mo Yu onemore@donga.com. 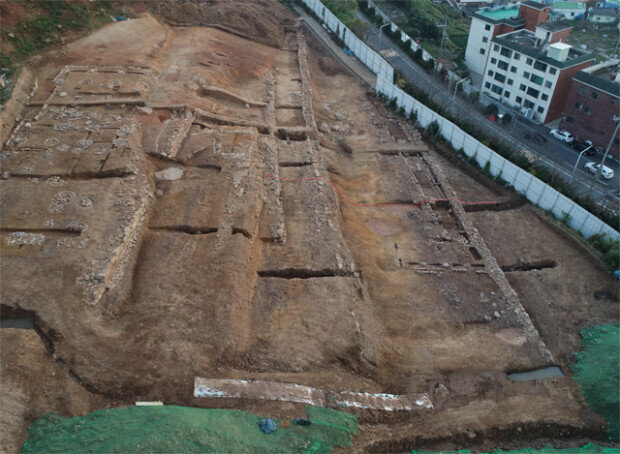 A historic site of the Jepo Waegwan, which served as a free trade area between the Joseon Dynasty and Japan in the 15th and 16th centuries, has been confirmed for the first time. Being the only one still in existence out of the three ports hosting Waegwan, the Jepo Waegwan is considered an archeologically significant excavation that proves the friendly exchanges between the two neighboring countries. The Duryu Cultural Research Institute, which conducted an inspection near Jedeok-dong, Jinhae District, Changwon in South Gyeongsang Province under the permission of the Cultural Heritage Administration, announced Tuesday that they have found the site of the Jepo Waegwan, which was operated from the early days of the Joseon Dynasty before the outbreak of the Japanese Uprising in Saryangjin in 1544. Located between the Jedeok Bay and the nearby hill, the site is around 7,302 square meters wide and has four-story terraced fields. Along with remains associated with housing such as retaining walls and a stylobate, hundreds of pieces of pottery and roof tiles were also excavated. This is the first time that the actual site of the Waegwan operated during the Joseon Dynasty has been confirmed. Thus far, the location of the Waegwan in three ports had to be estimated indirectly based on historic records including a book written by Shin Suk-ju (1417-1475). The sites of the other two Waegwan, namely Busanpo Waegwan and Yeompo Waegwan, are currently occupied by the Busanjin Market and a Hyundai Motor factory. As the Jepo Waegwan is the only remaining, the latest discovery is assessed to hold great significance.